pulling back into the belly. sighs do not come out. In and in and in and nothing. Natalie Webster’s poetry has been published in Take It to the Street Poetry’s Force Fed as well as on the on-line blog Infloressence. She received her B.A. 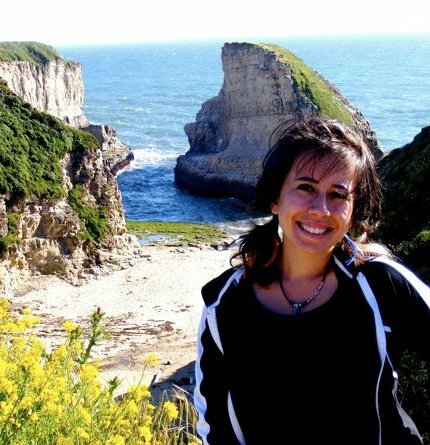 in Language Studies from the University of California at Santa Cruz and is currently pursuing a Master’s in Counseling Psychology from John F. Kennedy University. Her spare time is spent working creatively with children’s art classes on painting, creating and writing who, for better or for worse, are her muses. Natalie keeps a web scrapbook of inspirations and writing sketches at Ice and Coffee. between the void and the flood. No girl, no love, no life. And there are no poems. no tongues. And nothing. No one. The moon that cannot rise. I will never love because I never could. What we had was frameless and so it never stood. and fucked me. Eyes that said you wouldn’t. There are no poems for the tears I will not cry. No songs for what I won’t embrace. They stay where words end. warnings in the graying in the tides. the closing of the skies. and sweep away the dead. and feed me poisonous apples. Train song echoing, two A.M.
Wind’s blow turns to rain. forged upon the once barren framework of this: my frail structure. a long and desperately desired reprieve into sleep. The inability to grasp, obtain and hold on to the Calm. bent over under the burden of their weight. and contorted from ancient ravaging harvests. dropping its rot along paths once pristine and precious. Or are they there even still, as water washes over. towards the edge of this precipice: the unpayable debt.